Migration, Citizenship, and Development is a contribution to the academic and policy discourse on citizenship, migration and development. The conceptualisations, empirical findings, disciplinary discussions and applied methods can be incorporated in a variety of university classes and capacity building programmes. While many of the courses referred to are classes at the graduate level, several aspects may also be relevant for undergraduate level teaching. The explorations start at level zero and attempt to make all assumptions and steps very explicit. This enables students at all levels to follow the arguments and to rethink the critical steps and analyses. Migration from India and Immigration in the U.S. The book can be a part of courses on sociology of law. It provides an empirical study of how a legal status and legal benefits affect behavior and attitudes. Especially the rights effect in Chapter 4 is of concern, as this effect is based on the fact that the overseas citizenship of India grants its holder certain privileges, such as the right to live and work in the country. The Chapter shows that this affects not only the legal permissibility of certain actions and transactions but that these privileges also affect the decision-making process of diasporic actors, as is argued on the basis of Kahneman’s prospect theory. Lastly, a special status like OCI or the PIO card reduces the actual and expected cost of an operation through exemptions from formal requirements and by serving as official proof of being entitled. In summary, OCI as the conferral of privileges may affect development-related activities by enabling overseas citizens by granting special privileges, by affecting expectations in the decision-making process, and by easing the transaction process and reducing costs and risks. Further, the three additional principal effects that are explored in Chapter 5–7 regard other aspects how a legal status and its adoption can affect individual and group behavior. From the viewpoint of sociology of law, the action effects discussed in Chapter 8 are of interest because these explore in detail how the rights effect and the other principal effects have an impact on concrete actions. The Introduction elaborates upon the concepts of citizenship and nationality. Chapter 3 sheds light on the decision-making process that leads Indian immigrants to become U.S. citizens on the one hand, and to apply for overseas citizenship of India on the other. In addition to outlining the reasons, costs and benefits, as well as the underlying thought processes that prompt Indian immigrants to naturalize in the U.S. and to obtain OCI, Chapter 3 considers a person’s default option, social influences on the decision and factors that influence the timing of such decisions, as well as immigrants’ strategies to reduce the costs of such status passages. Chapter 3 elaborates upon the differences between the real and perceived privileges that are granted to holders of India’s special membership statuses and compares permanent status options that Indians living in the U.S. have. Chapter 2 contains a conceptual framework of migration and development, elaborating upon the notion of development and the diasporic activities that may affect developmental categories in India. Considering the major stages in the migration cycle, emigration, interactions between the migrants and the homeland during the migrants’ stay abroad—so-called diaspora options—return migration, and lastly, fourth re-migration, Chapter 2 considers a wide range of direct, intermediary and indirect effect of the Indian diaspora on the social and economic development of India, including investment, remittances, trade, philanthropy and social change, the transmission of knowledge and skills, national branding and political advocacy. In Chapter 8, several determinants for important development actions are explored in detail (remittances, investment, philanthropy, political lobbying, return migration, and re-migration). Chapter 1 classifies policy options for diaspora engagement policies and contains an overview of India’s policies, including the institutional set-up, communication and special economic policies. The chapter also introduces India’s diasporic membership policies, namely the overseas citizenship of India and the PIO card and discusses their origin and features. The discussion is important to understand the making of and conceptualization of special schemes to nominally incorporate diaspora populations and to explore the meaning of modern forms of ‘ state citizenship’. Migration from India and Immigration into the U.S.
Chapter 1 provides a broad overview of the migration pattern from India to the United States and sketches the socio-economic profile of the ethnic Indian community in the U.S. 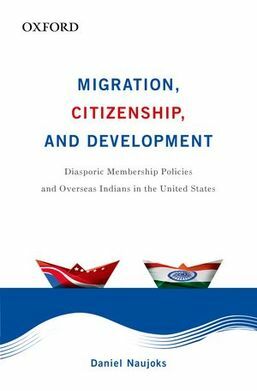 This includes not only different flows of permanent residents and their occupational characteristics but also student and temporary workers, secondary migrants, as well as the Indian population that resides irregularly in the U.S.
Chapter 3 includes an in-depth analysis of the reasons for Indian immigrants to become U.S. citizens, and Chapter 6 contains an analysis of Indian and Asian naturalization data in the US. The identity effect presented in Chapter 5 relates to OCI’s consequences for questions of identification and belonging. Grounded in the empirical study and an extensive review of sociological, social psychological, social identity theory and anthropological scholarship, the chapter offers both a theoretical framework and an empirical analysis of how a stronger identification with and attachment to India can increase interaction with the country. To this end, the chapter distinguishes three identificatory groups that diasporic actors may self-identify with and feel committed to and explores what role a citizenship-like status plays in this regard. Chapter 6 applies these categories of diasporic identification and commitment to the case of immigrant naturalization, exploring to why and through what mechanism the involved status passages affect categories of belonging. Introductory courses in sociology may want to incorporate any of the aspects mentioned above about development, social identity, citizenship and naturalization, and migration, as discussed and evidenced in the book. In addition, the Introduction and the Appendix contain a methodological discussion on using Grounded Theory in the tradition of Strauss and Corbin as a valuable qualitative research method.